Indian plaintiffs reacted angrily to a decision in a Manhattan district court Tuesday that dismissed claims for compensation from Union Carbide Corp. for environmental fallout from a gas leak which killed thousands of people in the Indian city of Bhopal 28 years ago. In 2004, activists working on behalf of residents who lived near the factory filed a class action lawsuit in the U.S. seeking damages from Union Carbide, now a part of Dow Chemicals Co., to finance the removal of pollutants from the site, pay compensation to residents whose water source was contaminated by toxic waste and set up a facility to monitor the health of local residents. Talking to India Real Time, Rachana Dhingra, activist at the Bhopal Group for Information and Action, one of the groups representing residents, said they would appeal. “We certainly hope something positive will come out of our efforts this time,” she said. 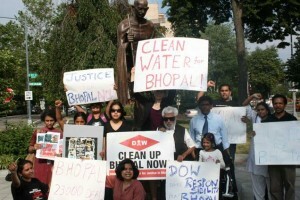 The lawsuit is one of many filed in the U.S. by residents of Bhopal and victims of the disaster. India’s Supreme Court in 1989 ruled Union Carbide had to pay $470 million in compensation for the deaths and disabilities caused by the gas leak, a decision that activists complained was inadequate. Union Carbide abided by the ruling. The incident — one of the world’s worst industrial disasters — occurred on the night of Dec. 3, 1984, when leakage of methyl isocyanate from a Union Carbide pesticide factory killed thousands in the central Indian city of Bhopal and left many others to battle life-threatening illnesses for years. There’s still no unanimity on the number of people who died or those who subsequently battled lung injury, neurological and reproductive disorders and respiratory difficulties — or died years later as a result of health complications. India’s federal government now says 5,295 people died and 4,902 suffered permanent disability as a fallout of the disaster, higher than its initial estimates at the time. Activists say the number is even higher than this. In 2010, India’s central government, citing the new higher death figure, filed a new petition to India’s Supreme Court that asks for over $1 billion in further compensation from Union Carbide. Hearings on the case have yet to begin. Activist groups in Bhopal have become co-applicants in this petition, though they are seeking much higher damages of $8.1 billion. “I have no idea when hearing will take place,” said Ms. Dhingra. Other activists said they were frustrated with the U.S. court system. “The courts in U.S. have not been sensitive to the plight of Bhopal victims. At least the Indian courts gave us $470 million, in the U.S. there’s nothing we have got so far,” said Abdul Jabbar, an activist with the Bhopal Gas-Affected Women’s Organization. He said the $470 million compensation that was paid in 1989 was too low as it did not take into account damages for environmental fallout such as soil and water contamination. “We went to the U.S. courts on the advice of many friends of the Bhopal movement. But now we are considering fighting the contamination case in Indian courts too,” said Mr. Khan. Recently, the Indian government decided to dispatch 360 tons of toxic waste lying in Bhopal warehouses to Germany for disposal, but activists said this doesn’t address the soil and water contamination that has happened over the past 28 years as toxic gases and chemicals have seeped into the city’s soil and water supply.